“What makes something a food court, and what makes it a food hall?” The question, posed by Slate’s Henry Grabar in 2017, is brought to mind by La Cuisine, a new dining space at the Rockland Center shopping mall in Quebec. 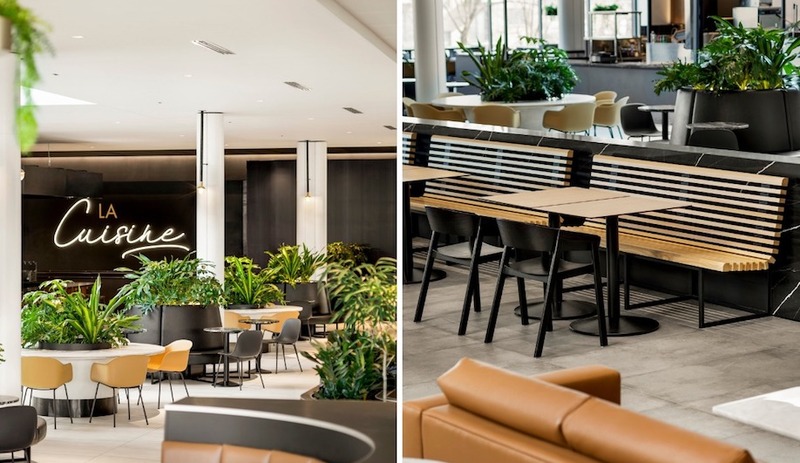 Situated just past the city limits of Montreal, the 20th century mall has unveiled a re-imagined dining experience, designed by Humà Design + Architecture and Architecture49. A far cry from the repeating rows of tables and chairs once anchored to linoleum floors in malls across North America, La Cuisine is a very different kind of space. Here, the aesthetic of an urban food hall – think Eataly on a budget – meets the takeout-style function of a mall food court. So what to call it? For starters, call it an intriguing space. 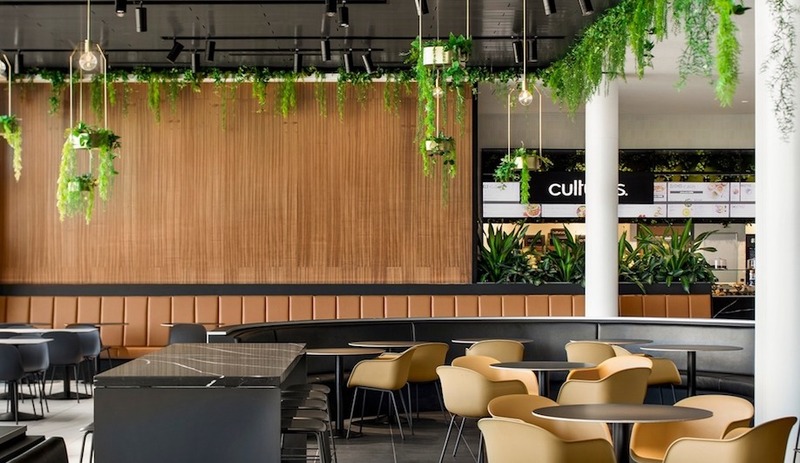 La Cuisine is designed as a collection of discrete environments, unified by touches of greenery and a consistent palette of tones and textures, as well as a variety of signature furnishings, including chairs and banquettes. 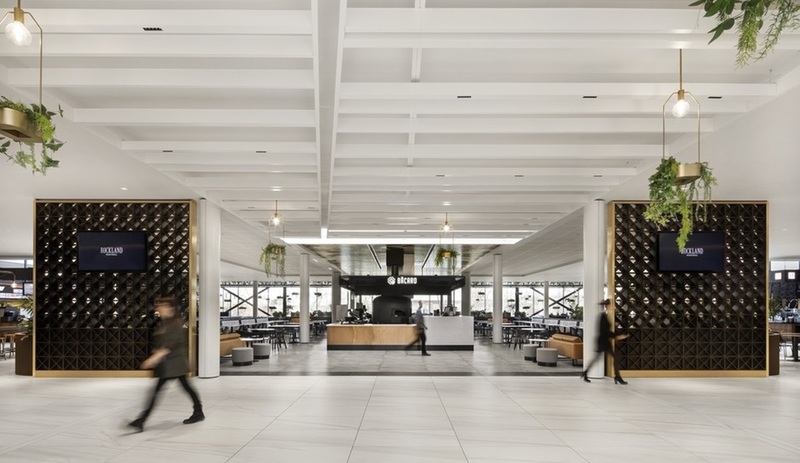 Combining fast food with more high-end offerings, the expansive hall is organized with seating spaces and restaurant booths interspersed throughout. At the heart of the project, a series of free-standing volumes – dubbed ‘food truck islands’ – give diners a close-up view of chefs at work. Framing these intimately configured islands, more traditional fast food counters line the north and south walls. The rows of restaurant counters reflect the configuration of a typical mall food court; one that often creates slightly claustrophobic environments for diners. Not here. 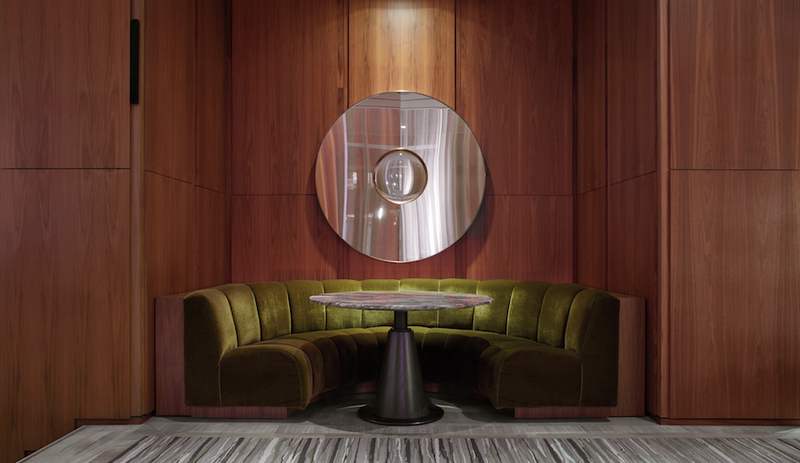 To provide a more comfortable ambiance, the Rockland Center’s northeast elevation was reconfigured with floor-to-ceiling windows, giving La Cuisine a much-needed sense of openness, and a signature space. 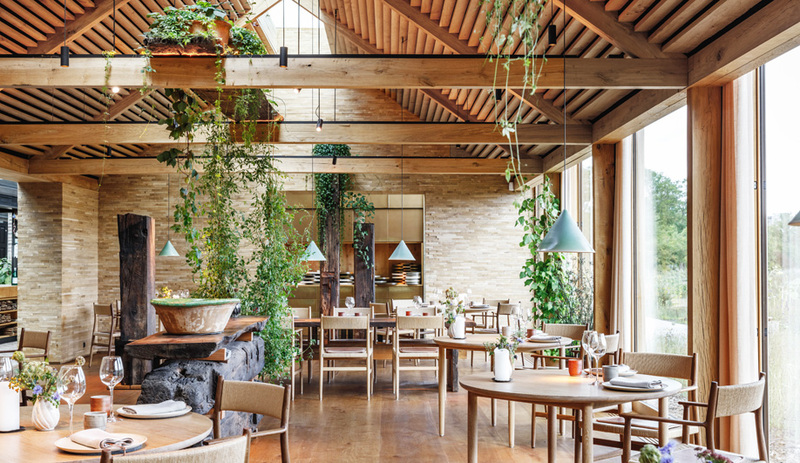 Hanging planters and long vines create an airy ambiance, which is carried through the entirety of the space by ample skylights and greenery. Lining the windows, generous seating areas flank a modest terrace, which offers outdoor seating in the warmer months. Closer to the food truck islands, a series of large circular planters define a more private environment. 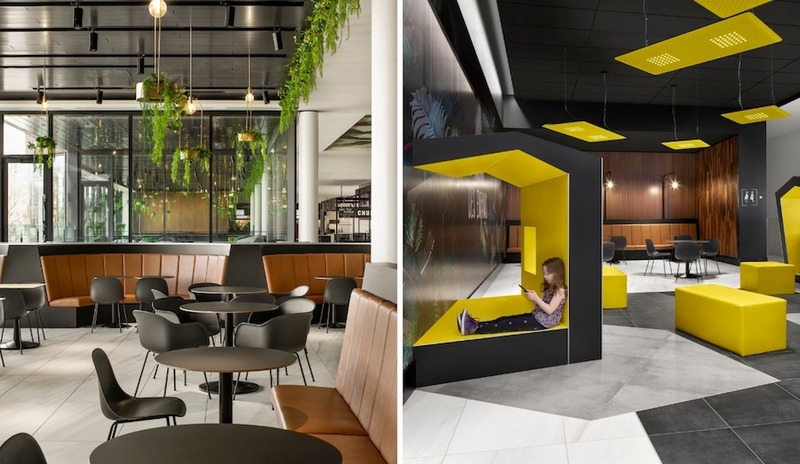 Nearby, park-style benches inform a slightly more casual garden atmosphere, while an enclosed children’s nook breaks away from La Cuisine’s smooth contours and earth tones with angular yellow furnishings. In the more trafficked spaces, high counters invite visitors to take in the bustle in a faster-paced setting. 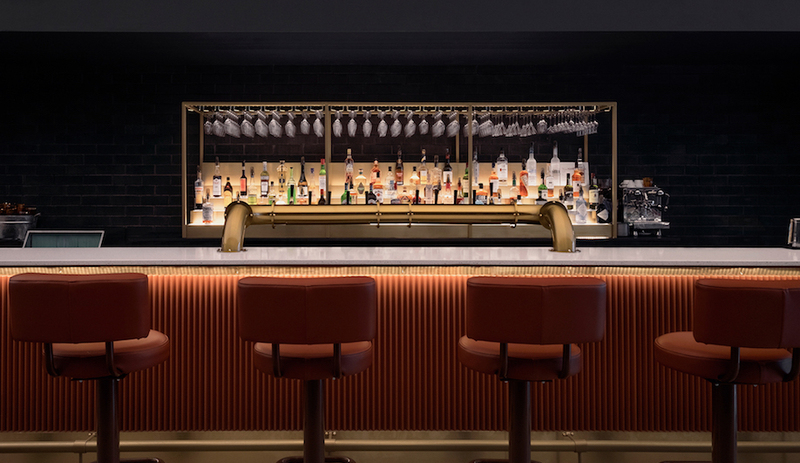 Across the 35,000 square foot expanse, warm wood tones and caramel-coloured furnishings accent the otherwise monochromatic colour palette, which is dominated by prominent use of black and white. 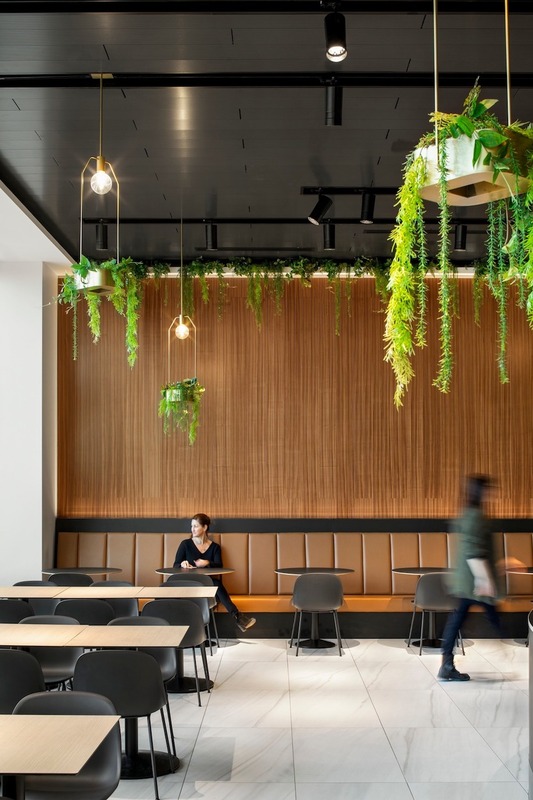 The repeating palette knits together a cohesive and legible aesthetic, while the preponderance of greenery helps to reinforce a unified identity. 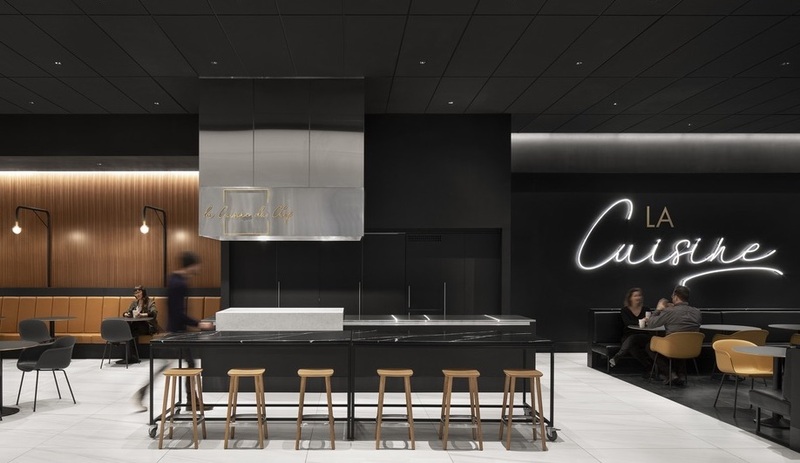 Compared to the nearly indistinguishable food courts still found in malls across the continent, La Cuisine is an obvious step up. 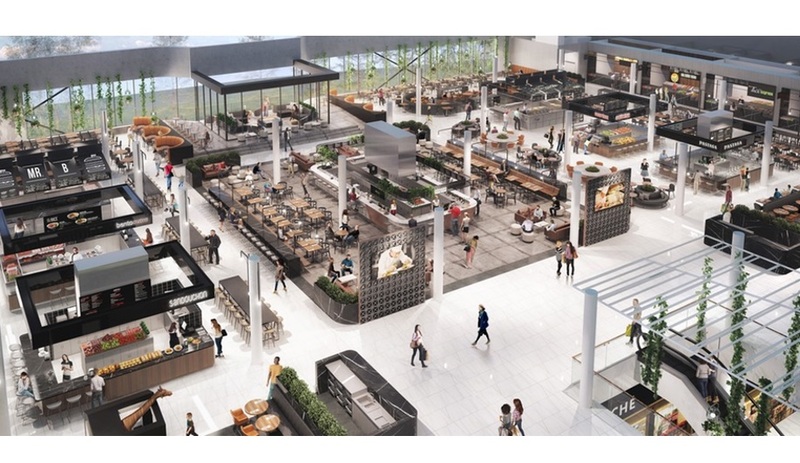 At face value, the new food court (or food hall?) 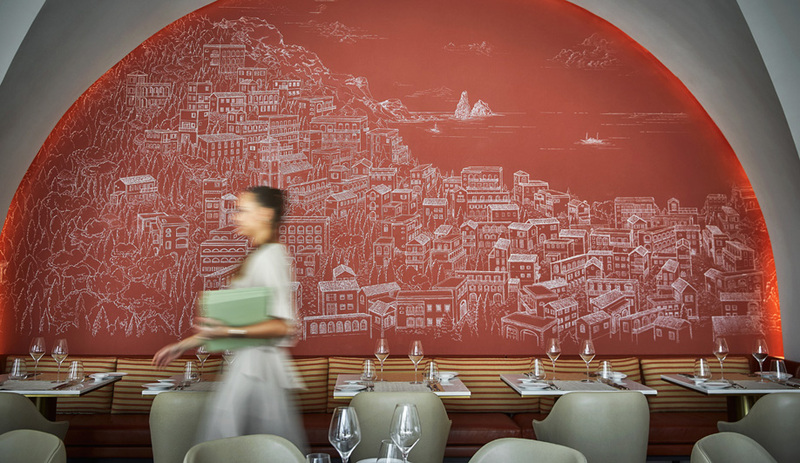 updates the space with contemporary aesthetics and higher-end culinary options. La Cuisine also aims to create a sense of place, complete with declarative neon signage that announces its name. For malls, many of which are struggling to remain profitable — and culturally relevant – in the age of Amazon, the appeal of an attractive dining space offers an experience that can’t be replicated online. Whether we call it a food court or a food hall, an Instagram-friendly place to eat can’t be bad for business.